Few things are as enjoyable and fundamental as camping. Odds are that if you’re engaging in an extreme sport out in the wilderness, you’ll need to camp someplace overnight because the best destinations are always the farthest. And if you’re skiing or ice climbing in the mountains, you have to do this in really frigid temperatures. While camping in regular temperatures is easy and relaxing, cold weather camping presents its own challenges and puts pressure on your body. That’s why I’m here to help. If you find yourself needing to go on a camping trip overnight in sub-zero temperatures, these are some useful tips to keep in mind. Cold weather camping doesn’t require any more equipment than camping in regular temperatures, but the gear has to be designed for the cold. Perhaps the most important piece of gear is your sleeping bag. This is the one thing that keeps the icy cold from bringing down your internal body temperature during the night. If you’re depending on a thin layer to warm you up, you’ll be in trouble. They make sleeping bags for general cold weather, but you need to get one for sub-zero temperatures when camping in extreme cold. The second thing that protects you while you’re getting much-needed rest is a camping mat. This is an underrated and oft-forgotten piece of gear. When you’re sleeping on the cold ground, it doesn’t matter how insulated your sleeping bag is, the cold will pierce it. A solid sleeping mat will keep your warmer and won’t cause the ground to dampen from your heat. Choosing the right place to set up camp can make a difference of 30 degrees. You’ll want to pick a campsite that’s sheltered from high winds and is on a place where you’ll be able to build a fire for warmth. Set up camp where boulders block winds that blow up and down the mountain. 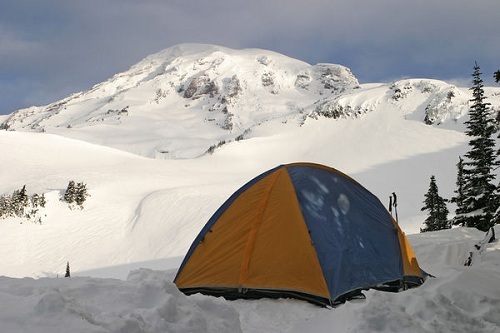 Beware of ledges or trees above your campsite that might drop snow or ice onto you unexpectedly. While some people go without tents, they really help provide extra insulation and protection from the harsh weather outside. 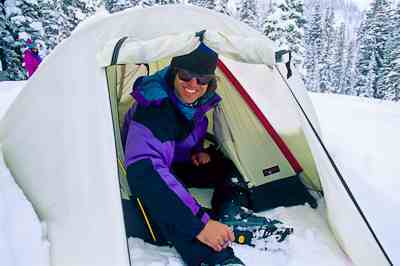 I suggest getting one of the heavy-duty cold weather camping tents. These help block the wind and keep you dry. If there’s one thing you remember about cold weather camping, it’s that cotton kills. When cotton becomes wet, either through sweat or from icy rain, it instantly becomes a deathtrap. It removes all insulation and is nearly impossible to dry. Another trick to staying warm is to wear at least three layers. Your inner layer should be synthetic material. The middle layer is the insulator, so you should opt for something like fleece. The outer layer should be waterproof and windproof to keep you protected from the elements. These three layers set the base, but you should also add accessories like hats and scarves to prevent warmth from escaping from your upper body. Eating right is the best way to keep you warm and healthy. In a simplistic explanation, your body creates warmth by burning sugar. Carbohydrates provide great long-term sugars, but if you wake up in the middle of the night and you’re really cold, a candy bar could provide temporary warmth. Tim Martinez is a freelance writer who blogs for various sites, including the official blog of Camping Gear Outlet. 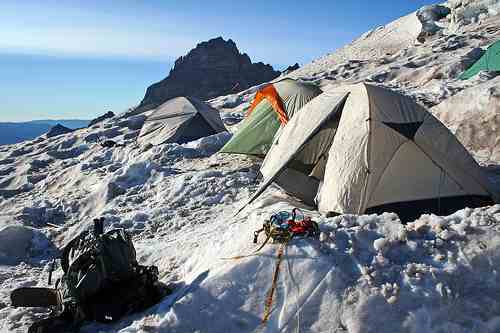 This entry was posted in Extreme Camping and tagged Cold Weather Camping, extreme camping. Bookmark the permalink.